Anastasia became an accomplished underworld enforcer, earning him the nickname of “Lord High Executioner.” Some also referred to him as “the Mad Hatter.” Anastasia became a powerful leader on the Brooklyn waterfront, where brother Anthony “Tough Tony” was a leader in the longshoremen’s union. A devoted friend of underworld giants like Charlie Luciano, Frank Costello, Joe Adonis and Nicola Gentile, Anastasia had a long rivalry with Neapolitan underworld leader Vito Genovese and with some of the traditional Sicilian Mafiosi in Brooklyn. Anastasia supported boss of bosses Giuseppe Masseria in the Castellammarese War of 1930-31. After the war, Anastasia emerged as the underboss in the Mangano Family. He also reportedly supervised a largely Jewish gang of Brooklyn killers used as Mafia enforcers. That gang became known as Murder, Inc.
Anastasia is believed to have approached the Mafia Commission asking to support Dutch Schultz by eliminating New York State Prosecutor Tom Dewey. 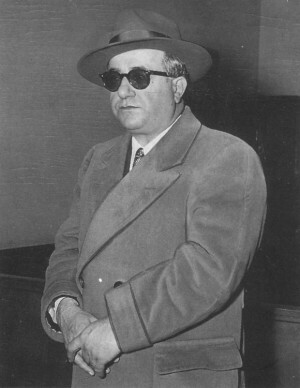 Mob boss Joe Bonanno suggested that Luciano had Anastasia float that idea before the Commission, so Luciano himself would not be linked with it. The proposal was rejected and ultimately led to the murder of Schultz. Dewey later hoped to use hitman-turned-state-witness Abe Reles’ testimony to prosecute Anastasia as the official go-between for the Mafia hierarchy and Murder Inc. But Reles suddenly decided to step out of a high-rise hotel window, ending the state’s case against Anastasia. In 1951, with the Manganos suddenly gone (Philip was found murdered, and Vincent disappeared), Anastasia rose to the leadership of that crime family. As Anastasia reached the pinnacle of the Mafia underworld, an old rivalry with Vito Genovese turned deadly. 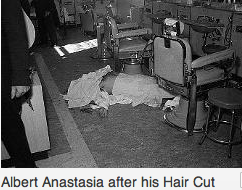 Anastasia was shot to death Oct. 25, 1957, as he sat in a barber’s chair in the Park Sheraton hotel lobby. The killing appeared to be part of a effort by Genovese to eliminate the Costello-Anastasia influence in the underworld (Costello was shot in the head – but survived – just a few months earlier and turned control of his organization over to Genovese). However, the assassination might have been the result of Anastasia’s recent moves to establish a gambling/narcotics empire in Cuba outside of the influence of usual Mafia-Cuba go-betweens Meyer Lansky and Santo Trafficante. Anastasia had made a recent trip to Havana and later scheduled a meeting with representatives of Cuban gaming interests in New York. 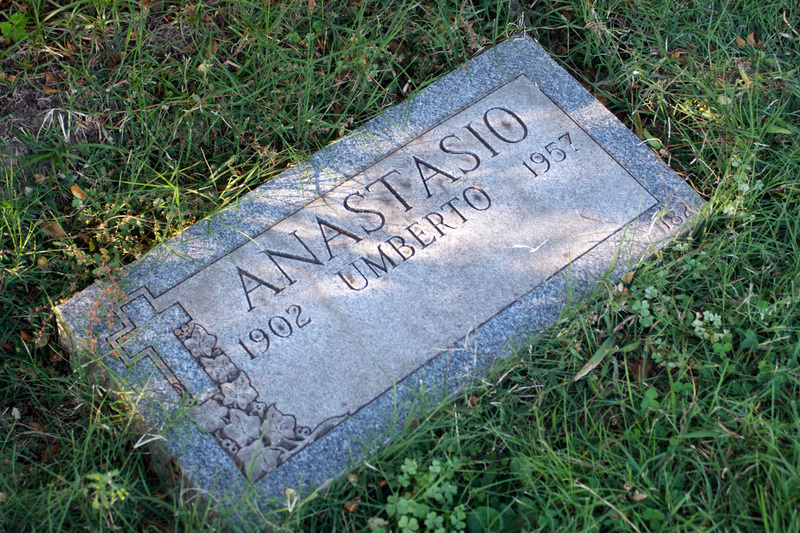 Carlo Gambino, who succeeded Anastasia as boss, Genovese, Lansky and Trafficante all had motives to do away with Anastasia and could have cooperated on the assassination.